A WINTER sun set low in the sky over Loughgiel Cemetery last Sunday, as republicans from across County Antrim joined the Carey family to commemorate the 17th Anniversary of the death of Volunteer Malachy Carey, Óglaigh na hEireann. As in previous years, those who remember Malachy recalled the many sacrifices which he made from he was first incarcerated in Crumlin Road Jail, in 1977, at the age of 21. After sentencing the following year, he joined the blanket protest on which he remained until it ended following the cessation of the second hunger strike, in 1981. Malachy spent 18 months sharing a cell with Bobby Sands, during a crucial stage in the protest for political status, which spanned both hunger strikes. He was an important member of Bobby’s team, in what were demanding and challenging times. Nicknamed ‘The Suitcase’, at one time he carried a comb, four Parker pens, a camera, 27 comms (communications) and part of an Irish grammar book, hidden inside his body, according to a fellow prisoner. Released from prison in 1987, after 10 years, he immediately reported back for duty to the IRA. He stood for Sinn Féin in the local government elections, later that year, polling strongly in Loughgiel, his native village. Following constant harassment by crown forces, and many threats upon his life by RUC personnel, they finally achieved their goal on 12 December 1992, when Malachy was gunned down in Ballymoney by a loyalist murder squad, at the age of 36. Such collusion by state forces and loyalists was prevalent in North Antrim and South Derry at the time, resulting in many republican deaths in similar circumstances. 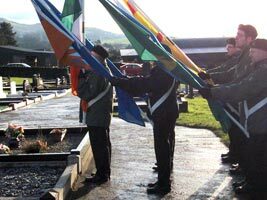 Wreaths were laid in honour of Malachy’s memory, by the Carey family, the Malachy Carey Cumann and the North & East Antrim Comhairle Ceantair, Sinn Féin.